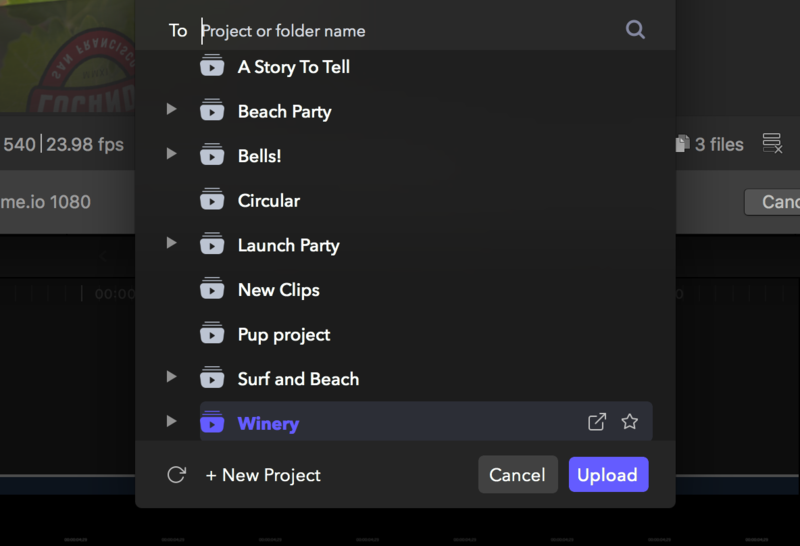 Upload your project as a flattened timeline, upload the individual clips from the project, or you can do both at the same time. Click Share at the top right and select a Frame.io Share Destination to open the Export Options menu. The Timeline is chosen by default while you can also select to export Clips from the Timeline. When selecting Clips, more options become available. Automatically version stack the timeline on Frame.io when uploading through the Mac App. If the previous version was uploaded through the web app, the timeline upload will not be auto versioned. Export only clips with markers is useful when you need to send specific clips. For example, you may need to send GFX 3 clips. Choose a marker type and then upload just the selected clips to Frame.io. Discard disabled clips when you don't want to send imported comments, audio tracks, etc. Export to-do markers as comments when you need comments imported into Frame.io. NOTE: this does not upload Standard markers as comments. Keep Rendered Files allows you to save the renders to a local drive. Search or scroll to find the project to upload your timeline or clips. You can choose the folders from the root of the project, but you will not be able to upload into secondary folders. By default, the last viewed project will be selected. If the Export Options menu is still loading (indicated on the bottom left corner) the project selection will refresh from the top project to the previously selected project. Selecting Upload will start the render and then will upload through the Frame.io Mac App. A desktop notification will appear when the upload is finished.